This week was a full-on working week with two long London trips. Although I didn’t have time to do any family history research, I did take the opportunity to visit the War Memorial at King’s Cross station. Over 20,000 railwaymen died in the First World War and there are various memorials to them dotted around the country. 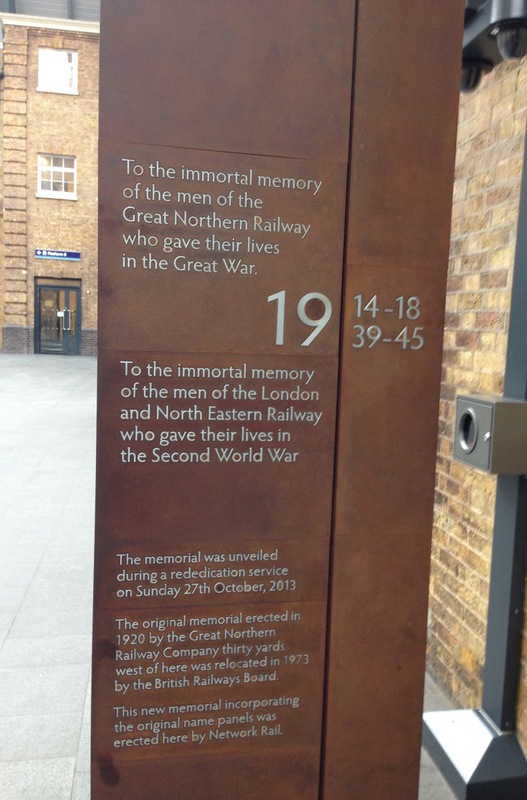 The one at King’s Cross is dedicated to employees of The Great Northern Railway (GNR) who lost their lives in that conflict. It contains 937 names. Originally erected in 1920, it was further dedicated to employees of the London and North Eastern Railway who gave their lives in World War Two. Their names are not listed. The memorial was re-designed and re-dedicated in 2013. Its 11 tablets are reminiscent of John Singer Sargant’s painting “Gassed“. I had a particular reason for wanting to stop off at the memorial. Amongst those named is William Colbeck. He was a parishioner at St Mary’s, Batley, and someone whose life I researched as part of my St Mary’s War Memorial book. Born in 1887, William was the son of David and Catherine Colbeck (neé Garner). He initially followed his father’s trade as a woollen spinner before switching to become a platelayer employed by the GNR at Batley station. William enlisted in March 1916, serving as a Sapper with the 264th Railway Company, Royal Engineers. The Royal Engineers by the end of the war numbered over a quarter of a million officers and men. Amongst a myriad of other construction roles, they built and maintained the railways. These were a vital part of the war effort, essential for moving men, supplies and equipment. So Williams specialist skills, developed in civilian life, were utilised during his military service. He died from pneumonia in the 41st Stationary Hospital, France on 6th November 1918 and is buried at Villers-Bretonneux Military Cemetery. Loved him here, I love him still. From his loving fiancée Elsie. More information about railwaymen who died in the First World War can be found at the National Railway Museum (NRM) website. It includes a searchable database on the fallen. I’ve included a series of close-up photos of the names of the men, which hopefully will be of use to those connected with the men commemorated. However, as with many War Memorials, not all those names you expect to find are included. Michael Lydon, another St Mary’s man, is one such example. According to newspapers he was employed as a goods porter by the GNR at Batley station. He lost his life on 1 September 1918. He does not feature on the GNR memorial or on the NRM database. It would be good if both men (and any others with connections) could be remembered at Batley Railway Station. This entry was posted in Batley, King's Cross, Railways, War Memorial, WW1 and tagged Batley, King's Cross, Railways, War Memorial, WW1. Bookmark the permalink. I suspect that may well be the case. Of the 76 men on the Batley St Mary’s War Memorial five, including William, died in late 1918/early 1919 of influenza-related illnesses. These are all likely to be linked to the influenza pandemic. Agh! I had taken bunch of pics of the memorial (am in London for a few days) I like you had reason to visit it, as part of my Merriman surname project. These picture are MUCH better than the ones I took. So cheers in these Jane. Should post this in the guild (goon) Facebook group!